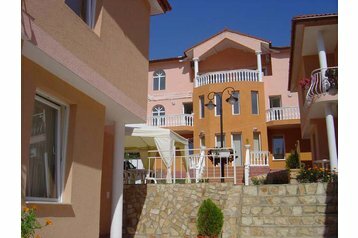 We offer a brand new tourist complex with beautiful villas and exquisite interior.For the pleasure of swimming and refreshing yourselves, we have provided a good-sized swimming pool with a Whirlpool, and a children’s pool and a playground for our youngest guests. The tourist Complex on a fenced around surface and lies about 10 min. away from the beach. The second largest Aqua Park in Europe, with its stunningly low in price entry tickets, is just 1,5km away. Bus stops in both directions are located at a distance of 300m away. There are shops for Your small household nearby. And in case, you prefer not to cook, you will find many restaurants offering dinner in a pleasant atmosphere with various show programs. You can taste there Bulgarian specialties or simply relax after a day full of exciting events. Zlatny piasaci, rekreačné zariadenie v časti Chayka, 500m od pláže. V hoteli / areáli sa nachádza trezor, terasa, záhradné posedenie, záhradný gril, exteriérový bazén, detské ihrisko. Rekreačný poplatok v cene. Parkovisko - strážené, neplatené. Autobus 150m. Vlak (stanica JP Gara Varna) 12km. Zlatny piasaci - centrum 12km.